The new generation Royal Oak Concept Flying Tourbillon GMT has the asymmetric look of contemporary architecture with its redesigned bridges and fully revealed flying tourbillon at 9 o’clock. A powerful mix of sandblasted titanium and black ceramic – with 10 days’ power reserve. Second time-zone indicator at 3 o’clock on sapphire plate, crown position indicator at 6 o’clock, flying tourbillon at 9 o’clock, white gold Royal Oak hands with luminescent coating, black inner bezel. Black rubber strap with sandblasted titanium AP folding clasp. Additional black alligator strap. The Santos de Cartier watch has an impressive history. The original Santos Dumont (invented in 1904 by Mr Louis Cartier for his friend, the Brazilian aviation pioneer Mr Alberto Santos-Dumont) is not only considered to be the very first pilot’s watch ever created, but also the first-ever men’s wristwatch. 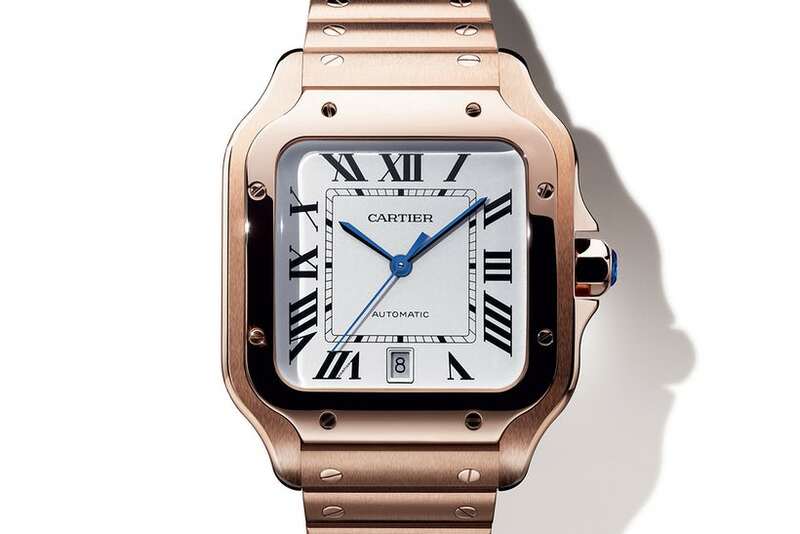 Equally impressive, the modern version of the watch – which, launched in 1978, took the square case of the original and added a steel bracelet and the watch’s trademarks screw details which is one of the key styles that helped transform Cartier into the globally recognised brand it is today. It was so successful in the 1980s, that it became perhaps the signature watch of that period, thanks in part to its appearance in movies from Wall Street to Clear And Present Danger. Since then, it’s been a favourite that has continued to receive tweaks such as the larger sized Santos Galbée XL in 2005 – but always remained true to the original, now-classic design. As throughout the history of Santos, the key updates here are subtle, but timely. The case, originally inspired by the silhouette of the Eiffel Tower, has been given slightly softer, more elegant curves that fit more comfortably on the wrist. The bezel has been extended towards the strap, which can now be interchanged easily, without tools, thanks to Cartier’s QuickSwitch system. What’s more, each watch comes with two straps – and the movement has been updated to Cartier’s in-house automatic calibre 1847 MC, which was introduced in the 2015 Cartier Clé collection. All styles come in two sizes: medium (at 35.6mm in diameter) and large (39.8mm), the latter of which features a date window at six o’clock. We recently was so impressed by a swiss watch brand we had to highlight there products as we believe they are the future of watchmaking. Cvstos is the brand which launched in 2005 , the watchmakers are extremely innovative in the design and tech whilst being sophisticated and elegant to wear. This exclusive brand is rising to the challenge of creating the style, quality and craftsmanship the markets demand so its no wonder its rise to success is rapidly growing. We will be featuring more from CVSTOS in the near future, so watch this space. Helfer Watches is a swiss watch manuafacturer creating some of the most beautiful watches in the market today. We met with the President of Helfer recently at the Top Marques exhibition in Monaco and was blown away by the sheer quality of the watches and history behind the watch. Helfers connection with motorsport is very apparent on seeing the sports collection of watches available, it gives you a feeling of quality just feeling the watch and seeing the rose gold finish. The use of quality materials from 3 layers of rose gold to carbon fiber bezels shows the attention to detail in the helper watches. We can’t wait to see more of this brand in the future. Patek Philippe is presenting The Art of Watches, Grand Exhibition New York 2017 which will take place from July 13th – 23rd, 2017 at Cipriani 42nd Street® in New York. The 10-day public exhibition will showcase Patek Philippe’s tradition of high-precision watch manufacturing, an insight into the company’s 178-year history as well as its heritage in the domain of Haute Horlogerie. Visitors will have the opportunity to discover the world of the last privately family owned Geneva watch company from the inside. For the first time ever a two-story structure has been created within Cipriani to accommodate the square footage required for an exhibition of this scale. Ten specific rooms (including the Theater Room, Current Collection Room, Museum Room, US Historic Room, Rare Handcrafts Gallery and Grand Complications Room) have been created to showcase unique environments. Visitors will have access to exceptional pocket and wrist watches dating back to 1530 in a space of 13,218 square feet. Watchmaker and Artisan demonstrations are some of the interactive activities taking place during the exhibition as a way to educate visitors on the inner-workings of fine watchmaking. After visitors have concluded their tour they are welcome to rest and relax in the Patek Philippe Café.